Liquid phase granular activated carbon adsorption (GAC) equipment removes organic contaminants from water. 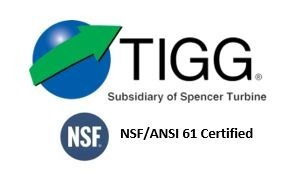 TIGG’s GAC adsorbers are used in groundwater remediation, stormwater treatment, PCB removal applications, municipal water treatment, and wastewater filtration. TIGG’s standard liquid phase activated carbon filtration equipment treats flows from one to 1,500 gpm. Our activated carbon adsorbers and filtration units range from 55 gallon liquid phase drums to 144″ diameter GAC vessels capable of full backwash. TIGG engineers can custom design unique activated carbon drums and complete integrated activated carbon adsorption systems that treat several thousand gallons per minute. TIGG’s CANSORB line of activated carbon water filtration equipment includes our ECONO Drum Adsorbers with epoxy-lined steel vessels. The filtration units are designed to have a low pressure drop, excellent flow distribution, and resistance to corrosive conditions. TIGG’s large, in-stock liquid-phase activated carbon adsorbers and water filtration systems are available for sale or ready to rent. For more information about TIGG’s Activated Carbon Adsorption Systems for Liquid Phase and Water Filtration, call 1-724-703-3020 or click here to contact us.